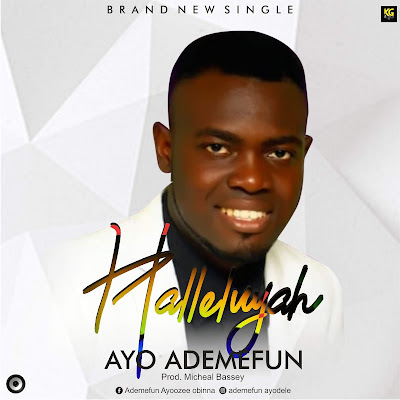 Ayo Ademefun, a gospel music minister in Nigeria whose ministry has spread to most part of the country. Presently stays in Lagos.. He is an anointed praise worship leader with holy spirit filled inspirational songs. He attends RCCG and started doing music at age 15 and was placed the leader of the choir. He is presently the leader n music director of the Refulgent team. A team set aside to carry God’s glory and pour it out through sincere and intense praise worship.. The song 'Halleluyah' was revealed some time ago through a special encounter with God in a worship program in church. This song 'halleluyah' is a preparation of the holy chorus we will be singing to our father in heaven..we join the great host of heaven to sing halleluyah to the Almighty God. And I heard as it were the voice of a great multitude, and as the voice of many waters and as the voice of mighty thunderings saying halleluyah for the Lord God omnipotent reigneth..